Kay's Crafty Designs: Christmas is coming. Its a cold and blustery evening here in Kilkenny. I wonder will we wake up to a white blanket snuggling up to the ground in the morning. Christmas is fast approaching and with it goes all the to-ing and fro-ing of preparation. 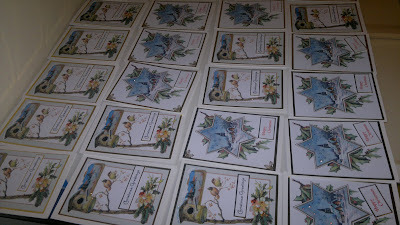 I have some cards made but have to still have to make a few special ones. I'm just putting up the batch that I put together first. I made 24 cards, 12 of each design. Here they are with the glitter glue drying. I printed out two of my favourite christmas toppers, then I matted and layered them with some gold mirri card and added the greetings. I also put inserts into them. I hope everybody's plans for Christmas are progressing along nicely or are you like me and gather some bits and pieces up and make a dash around nearer to Christmas and it all comes together anyway. Wow, Kay! That looks like a business! You seem to be very organised! Looking forward to seeing some of your icing designs!